"Never was a hero needed more..."
I have never been a huge fan of Hong Kong cinema. Specifically, I'm speaking of the action-heavy martial arts films, which launched the careers of such stars as Chow Yun Fat and Jackie Chan. I always found the action quite impressive, of course, but the thin storylines never did much for me, and there are genre conventions (including the abundant use of comic relief characters) that really turn me off. 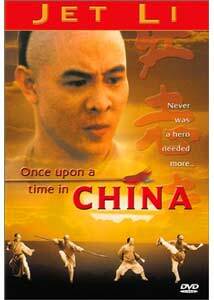 With that mindset, I sat down to watch Once Upon a Time in China, starring Jet Li (Romeo Must Die), and I found myself liking it quite a bit more than I'd expected. Yes, the constant attempts at comedy still bother me, but the storyline is quite a bit more involved than most, and the cinematography is quite beautiful. Li plays Wong Fei-Hung, a legendary Chinese martial artist (who, in reality, lived in the late 1800s/early 1900s). Wong was seen as a hero for his opposition to the "Westernization" of China and his hatred of Colonialism. On film, the character is probably most comparable to Her Majesty's James Bond. Many, many films were produced with Wong in the lead role (this one was the 99th), and several different actors played the part over the years. Once Upon a Time in China is unique in that it was one of the first in the series to really add depth and a narrative storyline (instead of just action, action, action). As the film begins, Wong's village is in turmoil. Colonizers are setting up compounds around the city and exerting rule over the Chinese commonfolk. Local thugs take advantage of the situation, charging "protection fees" to those business owners not already forced out by the foreigners. Wong, a kung-fu master and the teacher at a karate school, is head of a local militia that seeks to retake the city. Wong is a pacifist, and while he wants his people to be free, he does not want to accomplish his goals through violent means. However, when he discovers that corrupt villagers are selling their neighbors into slavery, luring them with promises of riches in America, he is forced to act. As you can see, the plot is a bit more complex than you'd expect from the average martial arts flick. Unfortunately, it is also a bit hard to follow. A lot is going on around the main plot, and frequently scenes return to a local theater group and one man in particular, who wants to defeat Wong and thus prove himself worthy of his continued existence. Perhaps it was a result of a poor subtitle translation, or even my ignorance of the history of China in the colonial age, but I had trouble following the story for much of the running time. That being said, the film is perhaps helped by the frequent tangents from the main storyline, as they help provide a much clearer picture of the temperament of the villagers and their reactions to the invading governments. On the surface, this seems to be an almost xenophobic piece of storytelling, but through the periphery characters (who don't figure into the slave trade plot per se) we see that as much corruption exists within the native population as does in the foreigners. Jet Li gives a commanding air and a real presence to his interpretation of Wong, adding weight to a role that would be next to impossible to perfect (who can truly embody a legend?). It is not only his deft and impressive work in the action scenes that leaves an impression; he shines in the quiet, dramatic moments as well. In retrospect, it's easy to see why he had so little trouble crossing over into American films. The director, Tsui Hark, has crafted a beautiful, sometimes moving film. The action scenes, with choreography from masters Yuen Chong-Yan and Yuen Shun-Yi, are beautifully shot, with a light touch and infrequent but effective use of both slow and fast motion. Six different cinematographers worked on the picture, but the visual look is uniformly artistic, with careful compositions and several obvious, but effective, metaphoric images. As I said, my only real problem was with the overabundance of comic relief. In the midst of the most dramatic events in the film, there are the comic characters, prat-falling and mugging for the camera. There is BuckTooth So, who exists only to stutter and break things, and Wing, who is fat, and thus, stupid and funny. Several scenes attempt to grant the characters some dignity, but it is always quickly taken away by the next dumb joke. I realize that these types of characters are a staple of the genre, but I find their inclusion detrimental to the film as a whole. It's a bit ironic that a film focusing on the loss of China's culture due to the invasion of Western influences has come to America, while the star, who in the film sought only to protect tradition, has left his homeland for Hollywood. Still, Once Upon a Time in China provides enough martial arts thrills and enough effective imagery and storytelling to remain an entertaining import. Image Transfer Review: Columbia TriStar is notorious for putting little to no effort into restoring their Hong Kong films for DVD. Once Upon a Time in China certainly received little attention in the video department. This is, hands down, the worst transfer on any DVD I own. The most apparent problem is the amazing amount of edge enhancement. In some scenes, the "ringing" effect is so overdone that the halos intersect. In addition, digital artifacts pop up constantly, no doubt due to the fact that both the 2-hour international cut and the 90-minute U.S. cut are housed on the same side of the disc. Other problems include the black level, which is downright terrible, with dimmer scenes looking very muddy, to excessive film grain, to the overall poor condition of the print used. For what is purportedly one of the most important martial arts films of the last decade, the lack of restoration for DVD is inexcusable. Audio Transfer Review: The audio fares a bit better than the video, put there is still little to impress. This is a mono track, and as such, everything is confined to the center channel. While the levels seem to have been mixed fairly well (music never overpowers the dialogue), things are still a bit spotty, with sound effects sounding harsh and flat. The score also is lacking in the lower registers, and it has a tendency to sound rather tinny. Extras Review: Once Upon a Time in China features several notable extras, one of them infuriating. All the standard extras are included, from filmographies to a trailer gallery featuring spots for martial arts imports from Columbia TriStar. A commentary, from martial artist, author, and genre expert Ric Meyers is also included. I found his comments to be quite interesting. He speaks constantly, with nary a pause, and he obviously prepared his comments beforehand, because he packs in lots of information regarding the historical basis for the story and its themes, the action choreography, the actors, and the critical reaction to the film. He's quite animated and peppers his comments with humor, making the track well worth a look. The other major extra is the one I alluded to being a bit upsetting. When I first was checking out the disc, I assumed that the purported extra "dubbed English version" was simply the same film, with an alternate audio track. In fact, an entire different cut was used for the English version, and it is presented here, in widescreen with 2.0 sound and no subtitle stream. Aside from the irritating fact that the English mix is stereo (the difference is negligible, anyway, as most everything is still relegated to the center channel), is the exasperating video quality. That is, the image for this, the butchered version of the film, is miles better than that on the official cut. It has nothing to do with the excised material, either. I did a direct comparison of the same scenes in both versions, and the dub was always better, suffering from less grain, less artifacting, and less edge enhancement. As for the quality of the recut film itself, it varies. While the storyline is easier to understand (as more of the Chinese culture is explained in a straightforward manner), much of the atmosphere of the uncut version is lost, as well as much of the beautiful cinematography, as there was some significant editing, both in chunks and within scenes. Oddly enough, even the action scenes, presumably all the American audience would be interested in, have also been cut down quite a bit. While the dubbed version is nice to have simply as a curiosity, I find it very frustrating that the video quality is so much better than the original. Purists are bothered enough by the dubbing and reediting, why taunt them with the vastly improved picture quality? Once Upon a Time in China is recognized as one of the best martial arts films of the last decade. I'm certainly not what you'd call a fan of the genre, and while I did appreciate the action and the attempt at an emotional storyline, I was a bit put-off by the muddled plot and overdone comic relief. Still, the choreography and the stunning cinematography certainly make this one of the best looking films in the genre. As for the DVD, the extras are quite nice, but they don't begin to make up for the horrid video quality.